Are Security Concerns Clouding your Judgement? 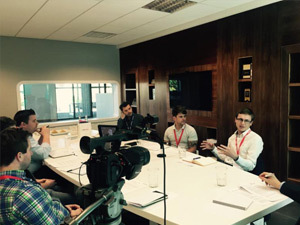 According to a group of cloud experts at a round table debate at UKFast, security concerns are the biggest hindrance on cloud adoption in the UK, but should they be? Lowri asks three different industry experts for their answers. Research from the Cloud Industry Forum (CIF) suggests 70 per cent of execs believe data security is their biggest concern during the decision-making process to move to the cloud. This, according to the round table experts, is a perception that needs to change. The experts urge consumers and businesses alike to change this negative opinion in order to adopt and reap the benefits of cloud. Richard Venables, director of RV group, believes bad press plays a huge role in the fear of cloud – with the good press being clouded by negative, scare-mongering headlines, such as the recent Talk Talk and BT data breaches. Imran Azam however believes that people in the UK as a whole are both familiar and happy with the cloud, and believes it’ll take a catastrophic breach to make consumers actually move away from it. Adam Caplan CEO of USP Training, a company that builds online education tools powered by the cloud, believes people need to know how to use the cloud successfully and safely in order to stay safe and realise the cloud’s full potential. Ultimately, all three have a point. Mega breaches over the last year or so have drawn much-needed attention to the fact that attackers are targeting the cloud as it grows, and that anyone can be at risk. On the other hand, it’s also important to avoid scaremongering and realise the incredible potential that cloud can offer, as long as businesses are educating themselves on how to use it safely – just as you would with any other new technology. As a starting point, watch our video below on top tips from the experts!